This famous life-saving station is at risk of losing nearly three-quarters of its land area to the ocean by the end of the century. USCG Sandy Hook, one of the oldest life-saving stations in the country, is located on the tip of a low-lying barrier spit. 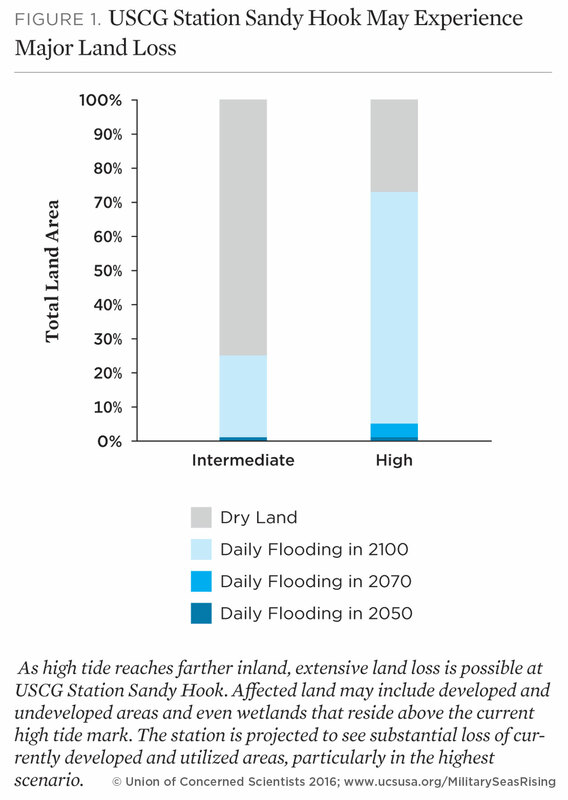 As sea level rises, its exposure to flooding from both high tides and storm surge will grow. Seas are projected to rise between four and 6.4 feet by the end of this century in the area around Sandy Hook. 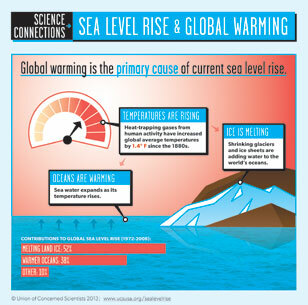 USCG Station Sandy Hook is situated within an East Coast hot spot of rising seas, where natural subsidence, low-lying topography, and changing ocean circulation patterns contribute to above-average sea level rise. one mile wide at its widest, is part of the National Park Service’s Gateway Recreational Area. Built in 1848, USCG Station Sandy Hook is one of the oldest and most famous life-saving stations in the country. 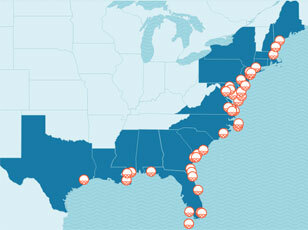 Today USCG Station Sandy Hook houses response boats, Coast Guard cutters, and other life-saving vessels. The station performs search and rescue operations and is responsible for law enforcement, environmental protection, and coastal security for regional waterways. USCG Station Sandy Hook is an integral part of the regional economy, to which it contributes approximately 1,000 jobs, $67 million in labor income, and $83.5 million in gross domestic product. Seventy active duty and 50 reserve personnel are assigned to the station. The results below outline potential future flooding scenarios for USCG Sandy Hook, assuming no new measures are taken to prevent or reduce flooding. Areas currently affected by occasional tidal flooding could flood daily. Certain low-lying areas of USCG Station Sandy Hook and the surrounding region are already affected by flooding during high tides more than 30 times per year on average. In the intermediate scenario, this flooding occurs more than 550 times per year by 2070—an average of more than once each day. Flooding during extreme high tides will become more extensive. Today, the station sees only small areas affected by flooding during extreme tides. But in the highest scenario, these tides encompass over half of the base and inundate access roads more than 30 times per year by 2070. Extensive land loss at USCG Station Sandy Hook is possible. Some parts of USCG Station Sandy Hook are projected to flood with such frequency by 2100 that they would effectively be part of the tidal zone as opposed to dry, usable land. Indeed, in the highest scenario, nearly three-quarters of the station’s land area floods with daily high tides. 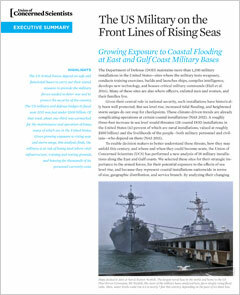 Sea level rise exposes previously unaffected areas of USCG Station Sandy Hook to storm surge flooding. In the intermediate scenario, the area exposed to storm surge flooding during a Category 1 storm in 2100 is equivalent to the area exposed to flooding by a Category 2 storm today. Sea level rise exposes USCG Station Sandy Hook to deeper, more severe flooding. By 2100 in the intermediate scenario, the area inundated by five feet or more of seawater during Category 1 storm surges increases from roughly 30 percent of the station today to roughly 80 percent. In order to plan effectively for the long term, military decision makers with authority over USCG Sandy Hook need to understand how sea level rise may permanently alter the landscape of this coastal installation and where the threat of storm surge may become intolerable. To take action, however, individual installations like USCG Sandy Hook will need more detailed analysis and resources to implement solutions. Detailed maps for each scenario at USCG Sandy Hook are available via Dropbox.